Don’t let your house or business be invaded by Wasps, Hornets or Bees. Twilight Pest Control are specialists in the control and removal of these stinging insects, and can provide a quick, ethical and affordable solution. 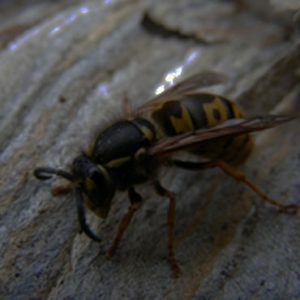 Twilight Pest Control specialise in the control and removal of Wasps, Bees and Hornets. We provide cheap and effective services in the Derbyshire and Staffordshire areas with treatments starting from a £45. Why you need to control or remove these pests? These stinging insects can be some of the most feared and aggressive pests around. Wasps and Hornets especially tend to reach their peak in August and September as their youngsters are reared, and the workers turn to the sweet food they prefer. This in turn can make them aggressive and sometimes unprovoked (but usually if annoyed or threatened), they will sting a human target in the vicinity. Bees are much more docile and only pose a risk if interfered with. For some people, the sting from a Wasp, Bee or Hornet can be very dangerous as some people react are allergic, acting violently to being stung. For all of these stinging insects, the risks can be avoided and dealt with by a professional treating or removing the nests. For all Wasp and Hornet treatments, Twilight Pest Control guarantee to kill the whole nest within the first treatment. In the unlikely event that a re-treatment is required, will provide this service free of charge! Where possible we will always try and remove and re-home any bees instead of administering an insecticidal treatment. Where this isn't possible then we will consider a treatment but only on the conditions there is a considerable risk to public health, and proofing measures are added after treatment. Please get the advice of a professional pest control company like Twilight before doing anything with Bees.